I think I was destined to be a cook........looking back at my childhood! I was fortunate to grow up with siblings and cousins. There were five of us whose ages were relatively close together. We played badminton, jump rope, ping pong, hide and seek. More often than not, we played cooking! After a feast of durian, the notorious fruit that either you love it or hate it, we would collect all the durian shells and pretending we were selling "pork ribs" in a market. We took turns playing a butcher and chopped away pieces of durian shells into smaller chunks for customers. Yes, I have experienced using a big cleaver at a young age! We also played restaurant where we rummaged to find leftovers in the kitchen to serve in our pretend restaurant. When there were no leftovers, we used leaves and twigs stir frying in an old deserted wok and served it to customers! When we were a bit older, we got to play with real food. My mom would prepare something for us to cook. We made crispy Thai crepes, grilled meatballs, satay, etc. My mom often told me that after an hour or so, all my siblings lost their interest and deserted the "play". It was me to keep cooking until the end! One of the fondest memories I have was when my mother dyed desiccated coconut left over from the making coconut milk into different colors. She also cut up some banana leaves for us to wrap around our pretend dessert. To this day, you can still find people using banana leaves for cooking or as a container. I love it since it's biodegradable and banana leaves also impart an exotic fragrance to food. When I was developing my menu for Thai-Tex-Mex for Dyne. I wanted to come up with something unique that included as many Thai elements as possible. One of the dishes was Three Cheese Enchiladas with Green Curry Tomatillo Sauce. The light bulb went off in my head! Why don't I wrap these enchiladas in banana leaves and steam them rather than just baking them in the oven. The steaming method would make the enchiladas luxuriously soft! I went to an Asian market and got myself a bag of frozen banana leaves and went to work. This brought me back to those fond memories of working with banana leaves for the first time. Here I will teach you an easy way to work with banana leaves. If you use fresh ones, which sometimes can be found in some Asian stores, you need to make them pliable first buy running the leaves over an open flame. An easier way is to use frozen banana leaves because you can skip that step altogether. You just need to defrost the leaves and wipe them clean. They are very cheap, try them! You can use it in place of parchment paper for fish en papillote. Your guests will think you are genius! You will need two pieces of banana leaves per package of enchilada. Notice that banana leaves have ribs where they can break apart so they need to be reinforced, by placing one leaf (10"+x12"), shiny side down, with the ribs going vertically. Then put another smaller piece (8"X10") also shiny side down, with the ribs going horizontally. 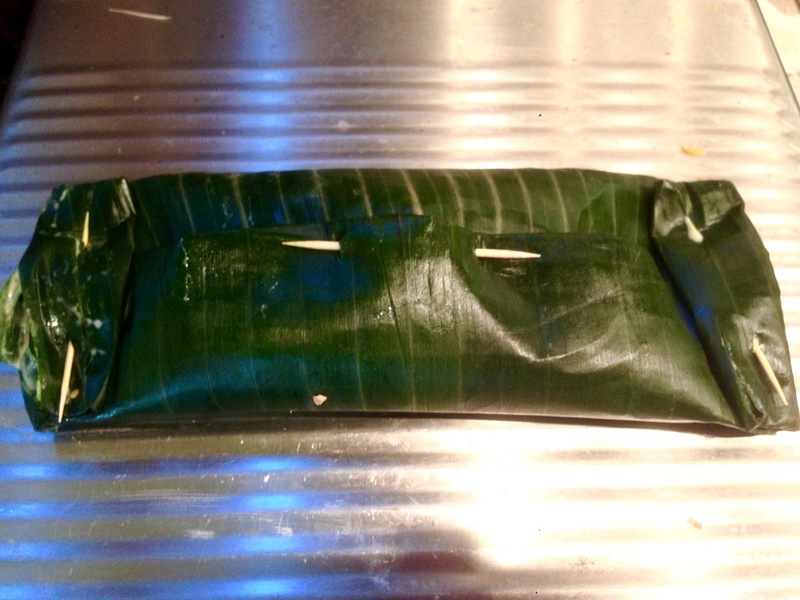 It is very important to prep your banana leaves this way otherwise your package will break easily. If you want to put two enchiladas in one package, the banana leaves need to be at least 10" or wider. Once you prep the leaves, you are ready to fill the package. First, the corn tortilla needs to be softened. You can do that by putting it in hot oil for a few seconds. Remember you are not frying the tortilla, you just need to soften it so it can be folded and hold your cheese. Finish softening up all your tortillas before you start making packages. Put one tortilla on a cutting board, putting a couple of tablespoons of shredded melting cheese of your choice (Monterey Jack, Cheddar cheese or mixed cheese) in the middle of it and roll it up, then place the enchilada seam side down. Repeat with the other enchilada. Now you can put your sauce, homemade or doctored up bottled sauce (Thai red curry or enchilada sauce -see my Semi Homemade post), on top (about 1/4 cup). It would help if the sauce is cold so it will not be too runny. Sprinkle some extra cheese on top. Now lift the edge of the package, the one closer to you, and the one further from you, to meet on top of the package. Fold it a couple of times to enclose it. Use a toothpick to secure the top. Now you need to close both ends of the package. Fold the right side a couple of times, then secure it with a toothpick. Repeat on the left side. Now the enchiladas are ready to be steamed (see picture below). Make sure to put a couple of marbles in the bottom of the pan with the water when steaming, which will start making clanking noises when the water level is too low. When you hear that add more water! For my first trial, I steamed my enchiladas for 10 minutes. The result was good. I knew I was on to something but I wanted to push it further. Next time I steamed them for 18 minutes. The corn tortilla came out light, pillowy soft with oozing cheese and imparted more distinct banana fragrance. The texture was more akin to tamale, which is a lot more complicated to make. My husband, who is a tamale hater for its dense and uninteresting flavors, loves this experiment. I have to concur with him. I do like this better than tamales from Mexican restaurants or Latino markets. Or may be I haven't had a really, really good one yet. I am happy to be convinced otherwise. Two pieces of banana leaves, one on top of the other. Note the horizontal and vertical ribs. Enchilada package ready to be steamed.